When you think of holiday decor, Duck Tape is probably the last thing that comes to your mind, but maybe it shouldn't be. I was sent a few rolls of Duck Tape in fun holiday designs recently and asked to come up with a unique craft idea for the holidays. At first I was at a loss of what to do, but once I started thinking outside the box, a ton of great ideas came to mind, like this adorable Duck Tape inspired holiday wreath made with Duck Tape, paper and cardboard! Step 1: Trace a large circle on a flat piece of cardboard and a smaller circle inside that one. I placed a large dinner plate on the side of a large cardboard box and traced it face down, and then I traced a smaller dessert plate face down inside that circle. This creates the shape for your wreath. Cut out around the larger circle and then cut out the middle. This will give you a cardboard wreath form. Step 2: Find 3 circular lids or items that you can trace around in varying sizes. I used the lid from a large peanut butter jar, a lid from a small peanut butter jar, and the lid from some foam cleaner that we had. You basically want a small, medium and large shaped circle. A circle punch tool would be handy, but I don't have one. Step 3: Lay a sheet of white cardstock lengthwise in front of you. Starting at the top, line the paper with the Duck Tape until the entire paper is covered. Trim off excess and repeat until you have one sheet of each design. Step 4: Trace and cut out three large circles from each of your Duck Tape cardstock sheets, three medium circles from two types of other cardstock, craft foam, etc. (I used a red cardstock and a glitter one.) and cut out three small circles of felt. You will also need to trace and cut out three small circles of cardboard. Step 5: Glue your felt to the cardboard to create a three dimensional look for your wreath. Step 6: Space and glue your large circles of Duck Tape cardstock at even intervals around the wreath with the hot glue gun. You can use the photo below as a guide. 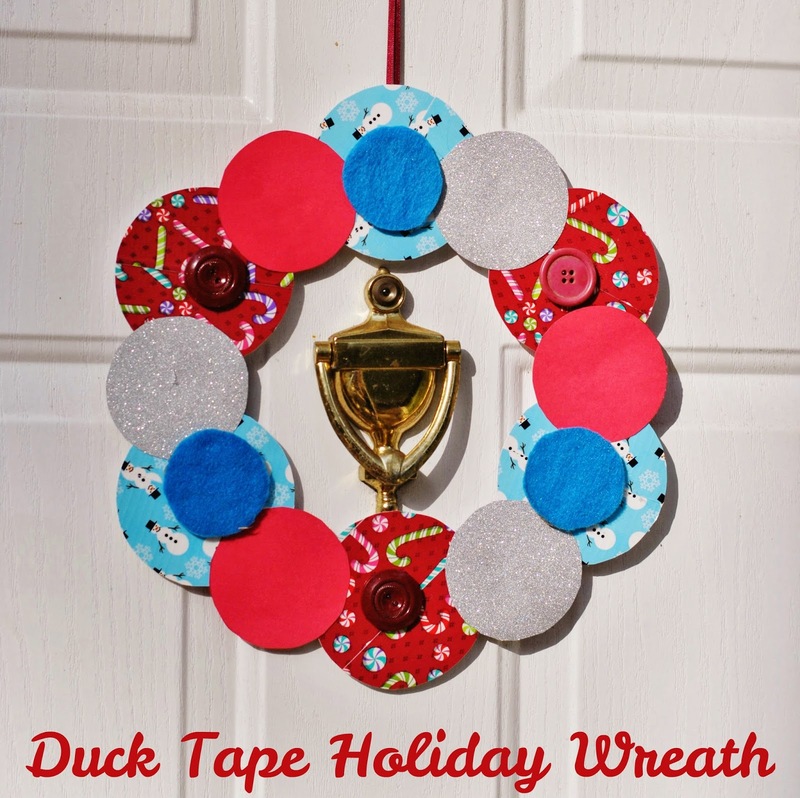 Step 7: Glue the six medium sized circles in the blank spaces between the large Duck Tape circles on your wreath. Again, you can use the photo below for a guide. Step 8: Glue on your felt covered cardboard circles to the wreath and add three large buttons if you wish. The buttons are optional, but I liked the way they looked and the added texture they provided. Step 9: Glue a loop of ribbon to the back of your wreath so you can hang it up. It can be a short or long ribbon depending on where you plan to display the wreath. Have you tried out the new Duck Brand® Holiday designs? If not, I encourage you to go out to your local retailer, pick some out and explore all the ways you can Duck the Halls this holiday season! You can do just about anything with Duck tape! I love to see duct tape crafts because the duct tape they have is always so cute. You can do so much with duct tape! You are so creative! I would never have thought up making a wreath like this! That turned out so cute. Duct Tape has so many different uses. This looks like something M can easily do with me! I want to do a heart for Valentine's day! Duct tape has really come a long way. I love that it can be used for crafts and other household uses. You are so clever! Love this idea. I love the patterned duct tape they have now. What a clever idea! I never would have thought to use duck tape! That turned out SO cute! I love it, and it's so bright & cheery! I have not seen the holiday designs but have seen some of their other ones. I love the moustache one! So cute and oh so easy to make!! This is adorable. I am amazed by the cute stuff that can be done with Duck tape.